When used on digital SLR cameras the AT-X M35 PRO DX lens gives the same angle of view as a 52mm lens. The close focusing distance of the M35 is an amazingly close 5.5 in. (14cm) yielding a macro ratio of 1:1 or life-sized reproduction with excellent sharpness. Its compact size makes it easy to carry almost everywhere and the wide f/2.8 aperture allows for easier viewing in low light situations. The front element of the AT-X M35 PRO DX has a newly formulated WR or “Water Repellent” optical coating on the glass. This new coating makes marks such as spots left by water or finger-prints much easier to clean than standard multi-coating. The lens is a result of cooperation between Pentax and Tokina companies and is known as smc Pentax-DA 35mm F/2.8 Macro Limited in the Pentax K system. The build quality is very good. The lens barrel is of moderate weight, made of plastic. The lens mount is metallic. The whole optical system of the lens moves considerably with focusing from infinity to the closest distance. The front element is deeply recessed inside the lens barrel which eliminates the need for a lens hood. 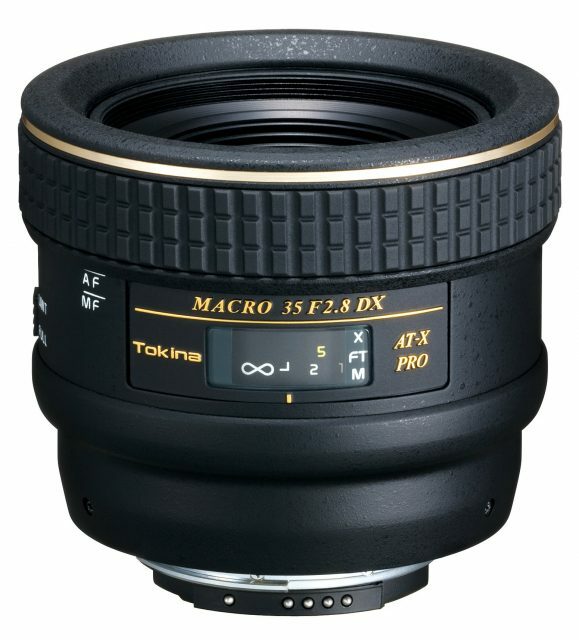 Nevertheless, Tokina offered small circular screw-in lens hood as a part of the package. The hood has threads to accept 52 mm filters. The lens features Tokina’s One Touch Focus Clutch mechanism for switching the lens between autofocus and manual focus modes. Please refer to the article dedicated to Tokina AT-X Pro Macro M100 AF 100mm F/2.8 D for more information on One Touch Focus Clutch mechanism. 0.14m - 0.18m Range of focusing distances suitable for shooting nearby subjects. 0.20m - ∞ Range of focusing distances suitable for shooting distant subjects. The lens uses affordable and widely-available screw-in filters with standard size of 52mm. The filter thread does not rotate during focusing which allows convenient use of different types of filters (including but not limited to polarizing and gradient). A Water Repellent (WR) coating has been applied to the outer surface of the front lens element to repel water or oil drops for easier cleaning of the lens surface. The round screw-in lens hood MH-522 fastens to the front thread of the lens barrel. The rigid construction and secure fit provide maximum physical protection to the front lens element. The sharpness is excellent at the center of the frame already wide open. The edges are very good wide open and excellent from F/5.6.